Glucose meters, thermometers, and other gadgets to monitor your health. 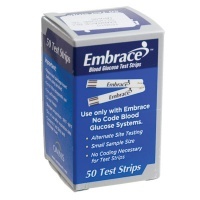 These Embrace Blood Glucose Test Strips are for use only with Embrace No Code Blood Glucose Systems. 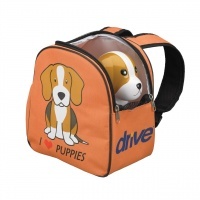 They offer alternate site testing and require only a small sample size. No coding is necessary for these test strips. Package contains 50 Test Strips. NOTE: For health and sanitary reasons, this item is non-returnable. The Prodigy Count-a-dose is a simple way to fill insulin syringes safely and accurately with one or two bottles of insulin (any brand). The bottle holder is marked to identify bottles for easy mixing - one raised dot for the first bottle and two for the second bottle. With the click dial starting all the way down toward the raised tactile minus sign, the user simply moves the click dial the number of times, or clicks, per unit of insulin needed. Each click of the dial toward the plus sign will draw one unit of insulin into the syringe. The Prodigy Count-a-dose is a simple system to learn and allows blind and low vision diabetics to measure from one to fifty units of insulin in single-unit increments. Count-a-dose uses a Prodigy 50-unit (1/2 cc) syringe or a BD (Becton Dickinson) 50-unit (1/2 cc) insulin syringe. Note: Color may vary. Product Measurements: 4.625" x 2.25" x 1.5"
Weight in Original Packaging: 3.3 oz. 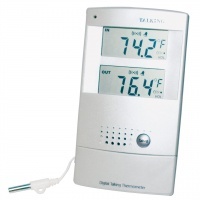 This Talking Digital Indoor/Outdoor Thermometer keeps you updated on the current indoor and outdoor temperature, so you can always dress properly and be comfortable indoors or outdoors. Why steam inhalation? 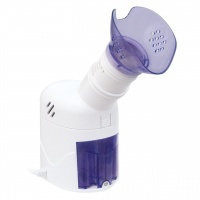 This Steam Inhaler provides natural, safe and effective therapy to help relieve symptoms due to allergies, bronchitis, colds, flu, laryngitis, rhinitis, sinusitis and more. Some of the features are: soft, flexible mask, extension tube, variable steam control, drain tank, aromatherapy tank, convenient indicator light, measuring cup, internal water chamber and a five foot power cord. 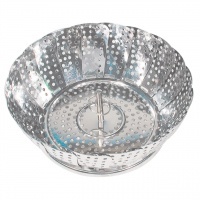 Preserve the natural flavor and nutrients of your foods with this steamer basket. Fits sauce pans. REIZEN Talking Scales are quality constructed bathroom scales, perfect for visually impaired or blind health-conscious individuals. A friendly female voice announces Hello, I'm Ready, weight in pounds or kilograms, in English or Spanish while weight is displayed on a big LCD screen that measures 3.25 in. wide x 1.50 in. high. 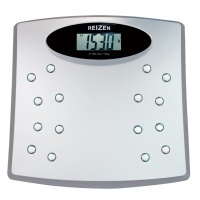 After ten seconds of non-use, the scale automatically shuts off and announces Goodbye. If no voice is desired, the voice mode can be switched off by a button on the back of the scale. The language selection button and kilogram/pound selection button on the back of the scale allows you to hear English in pounds or kilograms or Spanish in pounds or kilograms. Requires 9 Volt battery (included). Large 12 in. x 12 in. platform. Cook foods to the perfect temperature - every time! Hear the temperture spoken and avoid under- or over-cooking ham, turkeys, chicken, roasts, steaks - or whatever you're making. 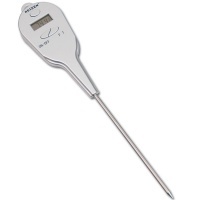 This Talking Digital Cooking Thermometer has a clear female voice. Apply the tip of the probe to the food to be measured and you'll get a voice reading of the temperature in a few seconds. 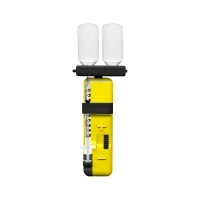 - Operates on 1 CR2032 Lithium Battery (included).